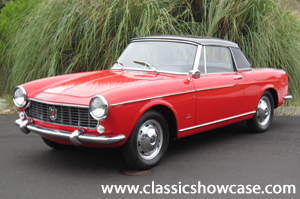 Car Condition: High-End Driver Level; This beautiful Fiat which had the body done by Pininfarina we are featuring here is a spectacular, original example that defines the great patina of this Cabriolet. There has been limited ownership since new, and it was originally purchased new in Barcelona, Spain. The car was not imported to the United States until 1992 where it was enjoyed and lightly driven. The car has been very well maintained and serviced on a regular basis, and has been kept in its original stock condition. It features the original gearbox, the rare factory hard and soft top in excellent condition, as well as bucket seats and roll up windows. It is a 4 cylinder, with 4-speed manual transmission, with 8.8:1 compression engine, rear wheel drive with a Weber carburetor. It comes with the original jack and spare tire. It is sporty, fun, collectable and rare, and an economical car that would make a great addition to any Fiat collection, or for the first-time collector! The body and paint is excellent with no rust, and the doors, hood, and trunk lid all fit well. The chrome and glass are also in very good condition, as well as the complete interior. It features plush carpeting, original steering wheel, instruments & gauges, and all original body emblems. Under the hood the Cabriolet is very complete and tidy, with a well-maintained and properly running engine, transmission, suspension and hydraulic system. This Fiat is a very good driver car, and you can enjoy it with the top down, or with the soft, or rare hard top on that are included! Sometimes you buy a car and you need to spend money to bring it to your liking. With this Cabriolet, you'll have a car that you won't have to spend any more money on, as it is ready for the road! The work that was performed by Classic Showcase is well documented, and all service records and information will be given to its lucky new owner! Launched in 1960 the Fiat 1500 Cabriolet had similar styling to the Fiat-Oscar model, although minus the other cars bonnet bulge. With only a 1481cc engine the 1500 Cabriolet was also slower than the Oscar model although its performance was far from disappointing. Standard equipment for both the 1500 Cabriolet and Coupe included servo assisted front disc brakes and a generous level of interior trim. The body itself was styled by Pininfarina and was extremely elegant. These Cabriolets were also commonly known as Spiders. Production of the 1500 sports range lasted until 1967.